SEATTLE – Maya Moore provided the example, reigning league MVP Nneka Ogwumike gladly followed along, and Sue Bird received attention and recognition she deserved. “I thought it was a great game, a great pace. You don’t want anybody to get hurt, but you also want to play with a certain intensity to show off your athleticism and I thought we were able to do that,” Moore said. Moore scored 23 points, Ogwumike added 22 points and the West outlasted the East 130-121 in the WNBA All-Star Game on Saturday, where most of the focus was on Seattle’s 10-time All-Star playing in front of her home crowd. 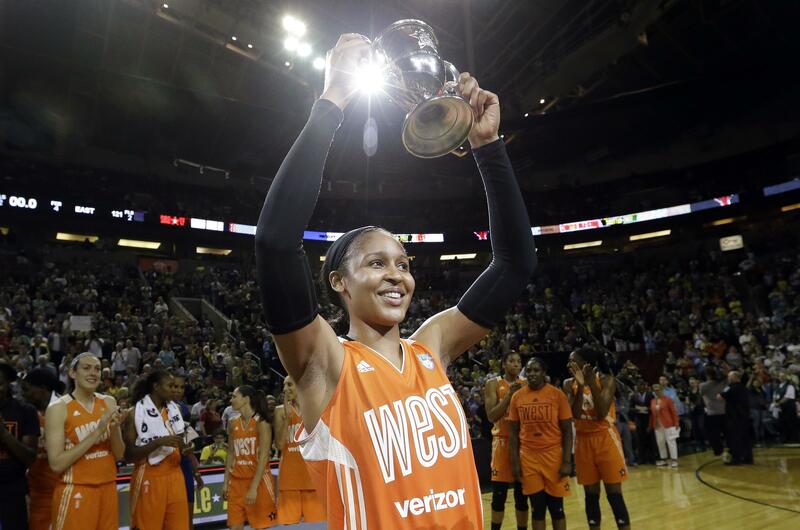 Moore was named the MVP for the second consecutive All-Star Game. Easier said than done. Bird received the loudest ovations as she was introduced, drowning out those that went to Taurasi, Seattle teammate Breanna Stewart and others. “I know when she always talks about Seattle she always gloats and she always gets a smile on her face. So it was nice to see that love back to her and you can tell it’s a mutual love,” Taurasi said. Bird seemed more interested in involving others than trying to take control of the game. Bird regularly bypassed her own shot to provide layup chances for Moore, Ogwumike, Candace Parker and others. Bird should have had one more assist after she dropped a no-look pass to Stewart, who proceeded to blow the wide open layup. Bird looked on in stunned amazement while Stewart sheepishly looked just as surprised. The competiveness started to emerge late as the East tried to rally from a 12-point fourth-quarter deficit, but Bird’s wide open 3-pointer with 4:05 left pushed the West’s lead back to 11. She threw her hands in the air after the make, following an underwhelming performance in the 3-point contest. The youthful East was led by Jones with a game-high 24 points, including a dunk in the final minute. There were eight first-time selections on the East roster, but Jones clearly came away as the most impressive individual performer. But Quigley – second in the WNBA in 3-pointers made per game – was nearly flawless in the finals, making 19 of 25 total shots to finish with 27 points and easily outdistance Rodgers and her 19 points. A $10,000 donation will be made by the league to the Patrick Quigley Memorial Scholarship in honor of her dad. “I had chills when Bill Russell was up on the screen and I saw how close he was sitting to us,” West coach Cheryl Reeve said. The attendees also included former WNBA All-Star Penny Taylor and U.S. women’s soccer team star Megan Rapinoe. Published: July 22, 2017, 9:29 p.m.